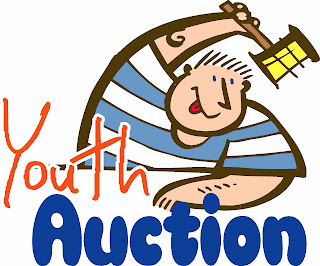 On my old site, I offered a four-part series on how to do benefit Auctions a churches. Upon re-reading that entry earlier this week, I was surprised at how confident I sounded. Don't get me wrong, the last few days have gone really well -- quality donations coming through, youth showing up to do set-up tables & chairs, lots of buzz at church, etc. -- but I can't help but feeling a little uneasy about how it's all going to go. This is the point where my more pious readers will tell me to "let go and let God"...or to rely on the Holy Spirit to intercede. Those people are right...and I will give both of those things a try. I also know that there will be some nervousness that will keep me motivated and on-my-toes in the next 20 hours and 27 minutes. In case anyone is interested, here's a run-down of the items that will be bid on tomorrow night. I intentionally included duplicates to reflect multiple donations of the same kind of thing. I'm gonna try posting a blog every day in Lent. This is not a "Lenten discipline" in the sense that I don't think that this practice will draw me closer to the Triune God, nor do I think that it's a major sacrifice. Additionally, I don't know that there is any real clamoring in the general public for a daily dose of my unsolicited opinions. I'm mainly doing this for me. I value the creative process that comes from writing free-form entries. So there you have it. I live an unpredictable life (well...for a guy with a minivan, a mortgage, and 3 kids). I don't have a lot of patterns or routines. Every once in a while, it's good for me to give rituals a try. So, between now and Easter (a.k.a. The Day I Turn 30), I am going to write something here on koinonia. This is something I'm doing in conjunction with my friend / youth ministry colleague, E-Hark...so, from time to time, she will appear on this space as well. 2008 was the Year of the Podcast, at least as far as I was concerned. Other than the occasional children's CD, I didn't spend very much time listening to music...I did the podcast thing. Religious podcasts, sports podcasts, youth ministry podcasts, comedy podcasts...I became obsessed; often uploading 4-5 hours of new podcasts each day. That's a lot of listening to people talk! Early last week, I was reminded about Pandora (the free Internet source for the Music Genome project). For some reason or another, I thought it had been shut down a year ago...but, clearly, I was wrong. The premise is simple. Just type in a song title, band name, or music genre...and let Pandora do the rest. You get commercial-free for as long as you're at your computer. I used to be frustrated that Pandora would play one song that I liked ever 20-30 minutes. They would pump me full of songs that weren't all that good, but were by bands that I liked. However, that has not been the case in my most recent experience with Pandora. It's got me listening to music about 3-4 hours a day...and has reminded me why I wanted to study music in the first place. Here is my list of "radio stations" I have created. Do you do Pandora? What are your thoughts? Are there other / better Internet radio sources that you prefer? I make no apologies for being a lover of basketball (a.k.a. The Greatest Game Ever). I also believe that the current crop of superstar players in the NBA rivals that of the late-1980s / early-1990s. Our church's Green Team has asked members to consider a new Lenten discipline - a Carbon Fast. In other words, instead of giving up chocolate or soda between Ash Wednesday and Easter, people are asked to give up something that makes a carbon footprint on our world. The Green Team offered 50+ suggestions of how people can use less carbon. Here's a church in the UK that did this last year. Some neat suggestions in that article as well. As an aside, our denominational mothership has a reputation of being overly deliberate and thoughtful (read: behind-the-times) in some of its social statements and policies. I was intrigued to discover that the ELCA adopted a Care for Creation social statement nearly 16 years ago...long before this most recent wave of environmental awareness made it popular to take care of our planet. Just call us Lutherans a bunch of trend-setters! I don't watch TV...other than Friday Night Lights...and even then, it's usually on-line in 10 minute segments over the course of two days. Ever since we disabled the cable / dish two years ago, I have removed television watching from my daily routine. , TX is Lutheran! I just hope they get the new Evangelical Lutheran Worship hymnal before the end of the season. Then, I caught the opening segment of an hour-long Dateline special about a murder that took place in a rural Lutheran church Pennsylvania. I had no intention of watching it, but once I saw the teaser, I was hooked. God's grace is not beyond the door of a jail cell. She's on our prayer list, and we pray for her every week. We'll heal in our own time. People are angry. I'm angry. But that doesn't mean God's grace is being withheld from her. She's where she needs to be and I've learned, in my own way, that there is grace even in that. Even in her incarceration. I trust and believe that. Posts like these are why Chris Scharen is currently my favorite theologian. I recently received a couple of interesting notes pertaining to a post I made over at luthermergent.org regarding Emerging Church (EC). They are from two youth ministers that I hold in high regard. I'm grateful for their candor. The way "EC" explains Christianity is nothing like Lutheranism. I like to think that we would actually have a few truths (like the trinity) that are irrefutable..we can dialogue about other issues, but the EC seems to be more of a believe what ou want, hence "post" in front of everything, including christianity. Just thought i would pass that along. They want to bring people together by not actually believing in anything, I like to think that we stand for something. I’ve been reading about the Emergent church for years now. I’ve read Tony Jones, Dan Kimball, Brian McLaren, et al along with numerous articles and posts. I’ve also looked at critiques of the Emergent church. Despite all of this I find myself to be very ambivalent about it. There are alot of things I’ve read that I say a hearty “Amen!”. I find much congruence with aspects of the Emergent conversation that matches our own Lutheran take on the gospel. But there is something that makes me uneasy and I don’t quite know what it is. Is it just my “Lutheraness” showing through or are there some fundamental issues at play here? Would love your thoughts. These friends of mine speak to the fears and reservations held by a a significant portion of Lutherans (and other Christians?) about this new-fangled religious expression. Is this just the latest fad? Is the EC just a support group for cantankerous middle-aged white men who don't like to play by the rules? What is the Emerging Church? Is it different from Emergent Church? What are the principles of an Emerging Church? Is it a "program"? Is it a denomination? Is it just a group of people who can't handle the notion of absolute truth that are trying to poison young, influential post-moderns into a gnostic form of Christianity? My love affair with the Emerging Church has been like the genesis of a teenage dating relationship. When you're first introduced to the person, you tend to become infatuated. You want to spend every waking moment with your newfound love. You can't imagine life without the other person, because they're all you think about...all you talk to your friends about. Your thoughts surge light-years ahead to considering marriage, children, etc. You develop an unrealistic perspective of how that person can change the rest of your life. Once you get to this point, the relationship can go one of two ways...you either take step back and enter into reality of who that person is, or you just break-up. On my way back from the Reclaiming Paul conference last October, I was ready to leave my denominational mother-ship, start my own church, and create a Mount Rushmore-esque homage to Brian McLaren, Tony Jones, Doug Pagitt, and Phyllis Tickle. I was done with heirarchical structures, congregational constitutions, and synod guidelines. I had found my "new church" - the Emerging Church (even though I didn't, and still don't, exactly know what that means.) I was so enamored with the EC conversation that I quickly decided that it wasn't just the greatest thing in the history of the Church...it was the one thing that would make-or-break the future of denominational structures for all time. Which was probably a bit silly. So where does that leave me today? I remain in love with and committed to the Church, most especially the portion of the Church that calls itself "emerging"...for two major reasons. I took a relatively lame Human Relations course in college, which was required for all education majors. The one thing that made an impression on me, however, was this quote -- "our similarities bring us together, and our differences keep us together." I think there's some truth to this; especially pertaining to the Church. I am an eccumenically-minded person. I believe Christians are called to be "one in Christ", but we spend more of our time dwelling on the handful of differences instead of rejoicing in the multitude of similarities. Furthermore, when we engage people we disagree with in conversation, all parties grow in faith and knowledge. The Emerging Church is by no means the first or only recent attempt at eccuminism...but I have appreciated the ways in which it has brought all kinds of Christians together for civil and respectful conversations about theology. Asking someone to describe "emerging worship" is like naming all 23 flavors in Dr. Pepper by taking one sip. The worship style is so contextual that it's difficult to discern larger trends. It's liturgical, it's contemporary. It's modern, it's ancient. It's lay-led, it's clergy-inspired (and vice versa). It's sacred, it's messy. The worship services I've participated in have infused a sense of purpose and intentionality in every aspect of the service. A kyrie and gloria may be taken from an old-school mass...followed by a litany written the night before by one of the church members. The prayers of the people might sound more like a community support group than a series of eloquently prepared petitions...or it might not. Songs might be sung a cappella or with a full rock band. All is to say, the Emerging Church, particularly in worship, seeks to embrace the traditions / rituals / practices that unite us with Christians who have come before us...but are more than happy to bring in new expressions that have particular relevance to 21st century disciples. I'm not sure where that leaves me at this point. I guess I remain, for lack of a better phrase, cautiously optimistic about the renewal that the EC conversation will bring to the larger Church. I think many of our church bodies could do Emerging Church kinds of things without having to slap a fancy new label on it...but, it seems, human nature occasionally requires new naming conventions to be applied to familiar ideals. For example, there isn't anything that House For All: Sinners and Saints in Denver, CO is doing that Windsor Heights Lutheran Church in Des Moines, IA couldn't do. Mainline, traditional, established churches aren't all that different from these wild new Emergent Churches. I think we're all well-served to remember that the church has both permission and the obligation to always reform itself...and to not discount the work of the Holy Spirit in the meantime. I spent last night with two famous Lutherans, Shane Battier and William H. Macy. I find this to be a fitting beginning to my new endeavor on koinonia. I'm an unabashed fan of basketball, movies, and Lutherans...and, as such, will probably spend most of my time touching on those topics. I hope all of you made it over here from my old site, <godsnowhere.wordpress.com>. I'm enjoying my switch to Blogspot. I get the sense that the ceiling is lower than Wordpress, but I also find Blogspot to be more intuitive and requires less user savvy when it comes to programming. Feel free to use the tools to the right to update your rss feed readers, or just subscribe to koinonia via email. I'm becoming increasingly convinced that there is no such thing as a solitary Christian. We are called to be in community with fellow believers, as well as with the rest of the world. Last summer, a group from our church visited our friends / partners in ministry in Jackson, MS. One of the highlights of that trip was to spend time in an old abandoned house that was rebuilt into a coffee shop, which was named the Koinonia Coffee House. The word koinonia keeps popping into my life, both in it's Greek form and also in the way it defines community...so that's what I'm calling this website...for now.